Are you interested in starting a winery in Northern New York? CCE Harvest New York has put together a report and interactive Excel spreadsheets on Starting a Winery in Northern New York: Winery Establishment Considerations and Costs. 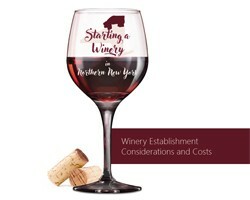 The report provides a general overview of starting a winery in Northern New York. You will find information on current wine sales, markets, winery establishment costs, licensing resources, growing grapes vs purchasing grapes or juice, winery building, and potential financial help resources. Additionally, we have created Excel spreadsheets to help you determine some start-up costs and considerations. Within the Cost Calculating Spreadsheet, you will find worksheets (tabs along the bottom) for Yield per Vine, Yield per Acre, a Tank Size Calculator (embedded in the Yield worksheets) and Production Establishment Cost. Instructions are provided on the top of each worksheet. NOTE: The spreadsheets can be used for the entire New York wine industry. They are provided as a general idea of the costs associated with establishing or expanding a winery and are not intended as a must-have list or an all-inclusive list. Use these interactive worksheets to calculate yield, tank sizes, equipment and additional costs.